Create a new design in Canva. 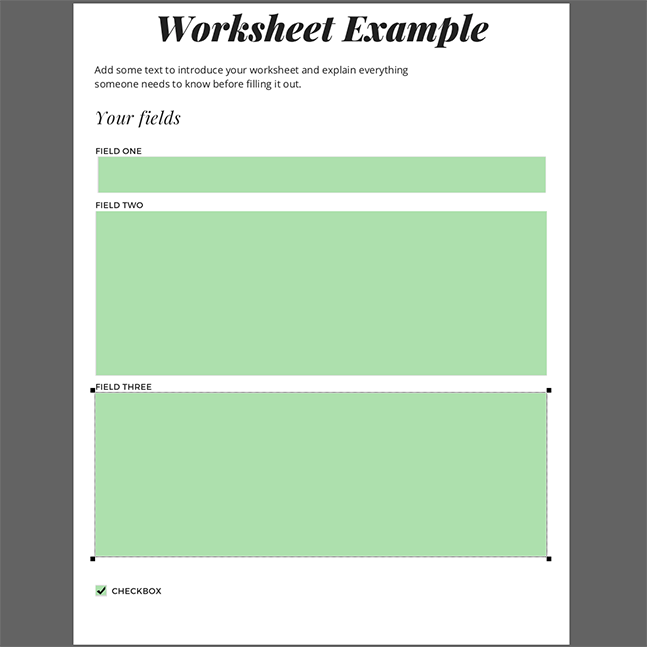 It can be any size you like, although for worksheets and workbooks A4 or US Letter size is common. We’ll choose US Letter size for this tutorial. Click Text on the left-hand side and add a heading, subheading or body text, or pick from one of the text templates Canva provides. Change the font and color to make it fit your brand. Add some text to introduce your worksheet and explain everything someone needs to know before filling it out. Then, add the visuals for your fields. Add the labels or questions for the fields the same way you add any other text. Add the field background by using shapes. 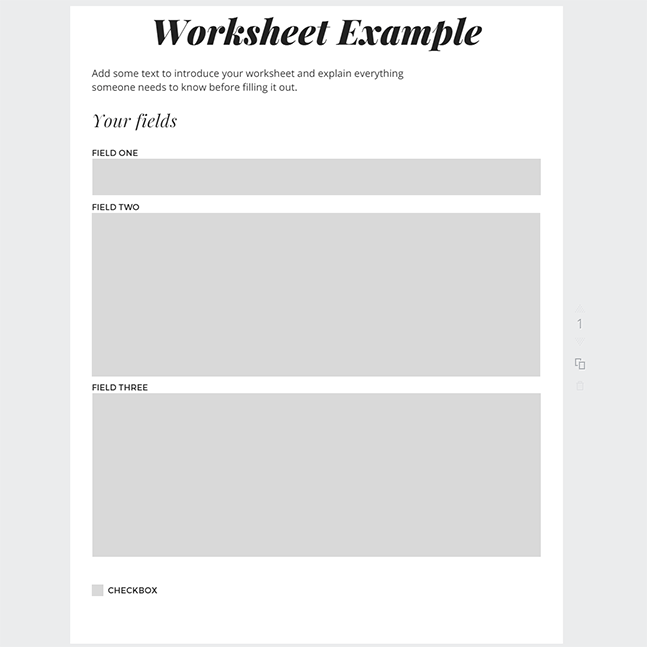 When you’re done designing your worksheet, hit the Download button in the top right corner of Canva. Download it as a PDF. For our purposes, whether it’s Standard or Print doesn’t matter. Text – for just one line of text, such as name or email address. Text Paragraph – for a paragraph of text, like a comment box. Checkbox – For a “Yes, I agree” checkbox, or, of course, a checklist. Radiobutton – For a list of choices where only one choice can be made, like Male/Female. Dropdown – For a list of choices where only one choice can be made. The list is only visible when it’s opened by clicking the arrow. Useful for a large list of choices, such as countries or U.S. states. Listbox – Similar to a dropdown, but shows more options at once and allows for multiple options to be selected. 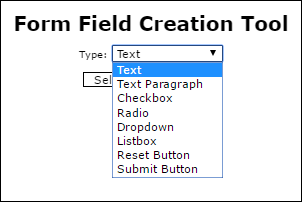 For our fillable form, we’re adding Text for Field one, Text Paragraph for Field Two & Three, and a checkbox. For the text fields, drag the corners to resize the field and make it the same size as the boxes you added in your design. If you’re creating a checklist for your subscribers to check off items, make sure to uncheck the checkboxes first. 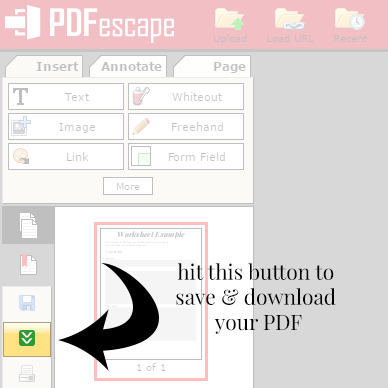 Finally, click the green box with two white arrows pointing down to save & download your fillable PDF. 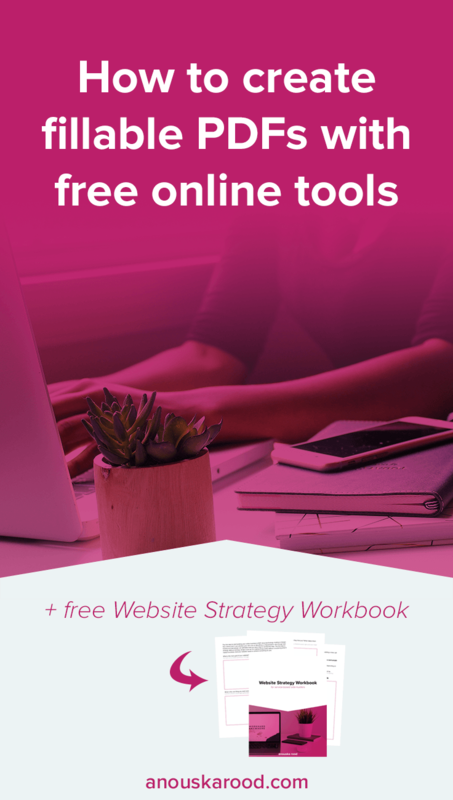 Open the PDF you downloaded, check that everything is working as expected, go back and make changes if needed, then use it as an opt-in freebie or content upgrade for your site! Want more subscribers? 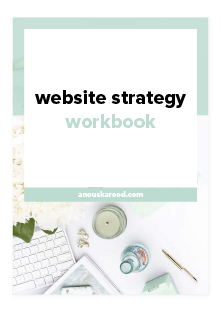 Get my free Website Strategy Workbook below.